Hamid Karzai International Airport (Pashto: د حامد کرزي نړيوال هوايي ډګر‎; Persian: میدان هوائی بین المللی حامدکرزی‎; IATA: KBL, ICAO: OAKB) is located 5 kilometers (3.1 mi) from the city center of Kabul in Afghanistan. It serves as one of the nation's main international airports and as one of the largest military bases, capable of housing over one hundred aircraft. 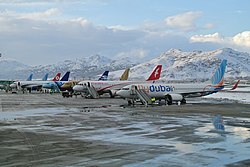 It was previously named Kabul International Airport and locally as Khwaja Rawash Airport, though it continues to be officially known by some airlines by the latter name. The airport was given its new name in 2014 in honor of former President Hamid Karzai. The decision was made by the National Assembly of Afghanistan and the Cabinet of President Ashraf Ghani. The airport has been expanded and modernized in the last decade. A new international terminal was added and the older terminal is now used for domestic flights. A number of military bases were also built around the airport, which are used by the United States Armed Forces and NATO's International Security Assistance Force (ISAF). The Afghan Air Force also has a base there, while the Afghan National Police provide security inside the passenger terminals. As of June 2016 the most frequently serviced destination from the airport was Dubai-International with no fewer than four passenger airlines flying the route, some with multiple daily flights. An American Atlas Air plane taking off from Kabul Airport in 2010. Kabul International Airport was originally built in the early 1960s by Soviet engineers when Afghanistan began to modernize. Tourists began visiting the country via Kabul International Airport. This era ended after the 1978 Saur Revolution, especially after the 1979 Soviet invasion. The airport was used by the Soviet Army during the Soviet–Afghan War, from 1979 to 1989. It was also used by the military forces of the former President of Afghanistan, Mohammad Najibullah, remaining in their control until 1992. By November 1996, the Islamic Emirate of Afghanistan governed by Mullah Muhammad Omar was in possession of the airport, until late 2001 when they fled the city after the U.S. invasion of Afghanistan. Due to international sanctions during the Taliban government, the airport was closed in the late 1990s, with very limited international flights. Following NATO's invasion of Afghanistan after the September 11, 2001 attacks, Kabul International Airport was bombed by United States and coalition forces. After the International Security Assistance Force (ISAF) took over control, the airport began to be developed slowly over the years. A new radar system was installed in 2005, which was upgraded by the U.S. Federal Aviation Administration in 2010. A new $35 million terminal for international flights was added in 2009. Afghan President Hamid Karzai and other high-profile figures attended the inauguration ceremony. The new terminal was officially opened to international flights in June 2009. The existing terminal has been refurbished and is currently being used for domestic flights. Passenger movements reached 100,000 per year by 2010 or 300 per day. In early 2012, the radar system was strengthened to cover Afghanistan's entire air space. The construction work for a new second runway began on 23 May 2012 at Kabul International Airport. The project will cost $26M and will be funded by the Japanese government, the runway will be 44 meters wide and 5.4 kilometers long with international standards. In October 2014, the National Assembly of Afghanistan proposed naming the airport after former Afghan President Hamid Karzai in recognition of his services and contributions to the country's rebuilding. A day later the Cabinet of President Ashraf Ghani approved the name change. The North Side Cantonment – Kabul International Airport facility was completed and turned over to the United States Armed Forces in October 2008. It houses the command facilities for the Afghan Air Force (AAF), and includes housing, administrative, operations, maintenance and recreation facilities. The project included two new hangar complexes, a new taxiway and ramps. It is the headquarters and main base of the Afghan Air Force. The first hangar facility was turned over to the AAF in January 2008. The second hangar was completed later that year. The airport has two terminal buildings, the modern for international flights and the Soviet built one for domestic flights. Several hangars along the runway are for military aircraft. There are no hangars for civilian (or transient) aircraft. The airport has 7 helicopter pads which are used mostly for military traffic. Fire fighting equipment is present. "The firefighting equipment has a capacity of up to 12,000 liters of water and has the ability and reach of 90 meters to control fire disasters, first of such modern equipment provided for the airport." Buses, taxi and private cars provide transportation to and from the airport. A 4 lane highway connects the airport to Kabul. On 2 January 1962, Iran Air Flight 123, a Douglas DC-3 on a cargo flight, crashed while attempting to take-off from Kabul. During the take-off roll the captain noticed a malfunction in the number 1 engine followed by the aircraft veering to the left of the runway. To avoid a crash, the captain pulled the aircraft up into the air, but while attempting to turn the aircraft away from the airport, a wing struck the ground followed by a crash. Both crew members survived. On 15 January 1969, Douglas DC-3 YA-AAB of Ariana Afghan Airlines was damaged beyond economic repair in a ground collision with Douglas DC-6 YA-DAN, also of Ariana. On 21 September 1984, a McDonnell Douglas DC-10-30 of Ariana Afghan Airlines was hit by explosive bullets while on approach to Kabul Airport. All passengers and crew survived the incident. On 12 June 1990, an Ilyushin Il-76 of Aeroflot was struck by a missile while flying at 22,500 ft (6,858 m) causing two engines to shut down. The aircraft made a forced landing in Kabul with no flaps on an unpaved runway. All 10 crew survived. On 29 May 1992, an Ariana Afghan Airlines Tupolev Tu-154 was struck by a missile while landing at Kabul. The nose of the aircraft was damaged but it landed safely. All passengers and crew survived. On 19 March 1998, a Boeing 727-200 of Ariana Afghan Airlines crashed into the 3,000 ft (914 m) Sharki Baratayi mountain while descending into Kabul. All 10 crew and 35 passengers on board died. On 3 February 2005, Kam Air Flight 904, a Boeing 737-200 operated by Phoenix Aviation, vanished from radar screens on approach to Kabul in poor weather, sparking a massive Afghan National Army search operation for the 96 passengers and 8 crew. The wreckage of the aircraft was found two days later in the mountains east of Kabul, all 104 people on board had been killed. On 17 May 2010, all contact with Pamir Airways Flight 112, an Antonov An-24 operated by Pamir Airways, was lost ten minutes after departure from Kunduz Airport. After search efforts lasting four days, wreckage from the flight was located twelve miles from Kabul. None of the 39 passengers and five crew on board the flight survived the crash. On 8 May 2014, Ariana Afghan Airlines Flight 312, a Boeing 737-400, ran off the runway after landing at the airport. Flight 312 originated in Delhi, India and operated on a scheduled passenger service to Kabul. On landing the aircraft overshot runway 29, coming to rest on uneven terrain. The aircraft was heavily damaged and six passengers were slightly injured. On 11 March 1985, an Antonov An-30 of the Soviet Air Force was on an aerial photography flight in the Kabul area south of the Panjshir Valley. Upon returning to the airport, the aircraft was struck by a Strela missile. The captain tried to make an emergency landing at Bagram Airbase but was too high. A fire ignited by the missile strike then reached the aileron controls causing the pilots to lose control; three of the five crew members evacuated the aircraft safely, but the other two crew members died. On 29 November 1986, a Soviet Air Force Antonov An-26 was hit by a Stinger missile while climbing out of Kabul. The aircraft was carrying several tons of S-24 rockets and 400 kg of explosives to Jalalabad in Afghanistan. All seven crew members perished. On 21 October 1987, a Soviet Air Force Antonov An-12BK collided with a Mil Mi-24 helicopter while taking off in poor visibility. The aircraft was heading for the capital city of Uzbekistan, Tashkent; 18 of the 19 passengers and crew died. On 21 December 1987, a Soviet Air Force Antonov An-26 was hit by a Stinger missile while circling to a safe altitude shortly after take-off. The number one engine was hit, puncturing the fuel tank. Smoke entered the cabin. All six crew members parachuted out; the captain jumped too close to the ground to open his parachute and died upon impact. On 24 June 1988, a Soviet Air Force Antonov An-26 was hit by bullets fired from Mujahideen rebels. The aircraft crashed in Kabul, killing one of the six crew members on board. On 28 August 1992, a Soviet Air Force Ilyushin Il-76MD was hit by a renegade Mujahideen rocket while boarding Russian embassy staff. On 5 August 2008, a Lockheed C-130H Hercules of the United Arab Emirates Air Force overran the runway upon landing in Kabul, causing a fire in the forward section of the aircraft. The aircraft was carrying aid to Afghanistan. All crew members survived. On 8 September 2009, at around 8:22am local time, a suicide bombing took place near the entrance of the airport's military base. On 3 July 2014, Taliban fighters fired two rockets into the airport, destroying four helicopters. One of the four helicopters belonged to Afghan President Hamid Karzai. On 29 January 2015, three American defense contractors and one Afghan national were killed by a gunman outside the airport in late evening local time. On 17 May 2015, a suicide bombing by the Taliban near the entrance of the airport occurred, killing three and injuring eighteen. ^ a b "Super Tucano in Service in U.S. Air Force". ^ "Hamid Karzai International Airport (Kabul)". hamidkarzaiairport.com. Retrieved 29 February 2016. ^ a b "Cabinet names Kabul Airport after Karzai". Retrieved 1 June 2015. ^ "Press Releases 2010 - Embassy of the United States Kabul, Afghanistan". Archived from the original on 19 October 2015. Retrieved 1 June 2015. ^ "Karzai opens Kabul air terminal". BBC News. 6 November 2008. ^ "Kabul International Airport to be provided with modern equipments". Retrieved 1 June 2015. ^ a b c "Istanbul New Airport Transition Delayed Until April 5, 2019 (At The Earliest)". onemileatatime.com. 20 February 2019. Retrieved 2019-02-26. ^ "ASN Aircraft accident Douglas C-47-DL (DC-3) EP-ABB Kabul-Khwaja Rawash Airport (KBL)". Aviation Safety Network. Flight Safety Foundation. Retrieved 1 June 2015. ^ "YA-AAB Accident Description". Aviation Safety Network. Retrieved 23 January 2011. ^ "ASN Aircraft accident McDonnell Douglas DC-10-30 YA-LAS Kabul". Aviation Safety Network. Flight Safety Foundation. Retrieved 1 June 2015. ^ "ASN Aircraft accident Ilyushin 76MD CCCP-86905 Kabul". Aviation Safety Network. Flight Safety Foundation. Retrieved 1 June 2015. ^ "ASN Aircraft accident Tupolev 154M YA-TAP Kabul". Aviation Safety Network. Flight Safety Foundation. Retrieved 1 June 2015. ^ "ASN Aircraft accident Boeing 727-228 YA-FAZ Kabul Airport (KBL)". Aviation Safety Network. Flight Safety Foundation. Retrieved 1 June 2015. ^ "ASN Aircraft accident Boeing 737-242 EX-037 Kabul". Aviation Safety Network. Flight Safety Foundation. Retrieved 1 June 2015. ^ "ASN Aircraft accident Antonov 24B YA-PIS Salang Pass". Aviation Safety Network. Flight Safety Foundation. Retrieved 1 June 2015. ^ "ASN Aircraft accident Boeing 737-4Y0 YA-PIB Kabul Airport (KBL)". Aviation Safety Network. Flight Safety Foundation. Retrieved 1 June 2015. ^ "ASN Aircraft accident Antonov 30 05 red Kabul Airport (KBL)". Aviation Safety Network. Flight Safety Foundation. Retrieved 1 June 2015. ^ "ASN Aircraft accident Antonov 12 registration unknown Kabul Airport (KBL)". Aviation Safety Network. Flight Safety Foundation. Retrieved 1 June 2015. ^ "ASN Aircraft accident Antonov 12BK registration unknown Kabul Airport (KBL)". Aviation Safety Network. Flight Safety Foundation. Retrieved 1 June 2015. ^ "ASN Aircraft accident Antonov 26 registration unknown Kabul Airport (KBL)". Aviation Safety Network. Flight Safety Foundation. Retrieved 1 June 2015. ^ "ASN Aircraft accident Antonov 26 29 Kabul Airport (KBL)". Aviation Safety Network. Flight Safety Foundation. Retrieved 1 June 2015. ^ "ASN Aircraft accident Ilyushin 76MD CCCP-78780 Kabul Airport (KBL)". Aviation Safety Network. Flight Safety Foundation. Retrieved 1 June 2015. ^ "ASN Aircraft accident Lockheed C-130H Hercules 1212 Kabul Airport (KBL)". Aviation Safety Network. Flight Safety Foundation. Retrieved 1 June 2015. ^ Sneha Shankar (4 July 2014). "Taliban Fires Rockets At Kabul Airport Burning Down Afghan President Hamid Karzai's Chopper". International Business Times. Retrieved 1 June 2015. ^ "Gunman kills 3 American Contractors". foxnews.com. Associated Press. Archived from the original on 2015-01-29. Retrieved 29 January 2015. ^ "Suicide bomber kills three and injures eighteen". bbc.co.uk/news. BBC. Retrieved 17 May 2015. This page was last edited on 18 April 2019, at 05:55 (UTC).